The premise is the same this time around. Sandler is back to voice the overly protective, positively batty sitcom dad Dracula who hovers over his only daughter. He runs a hotel exclusively for monsters so they can get away from those pitchfork toting angry mobs, but Drac has reluctantly opened the hotel to humans as well after his daughter marries a human. 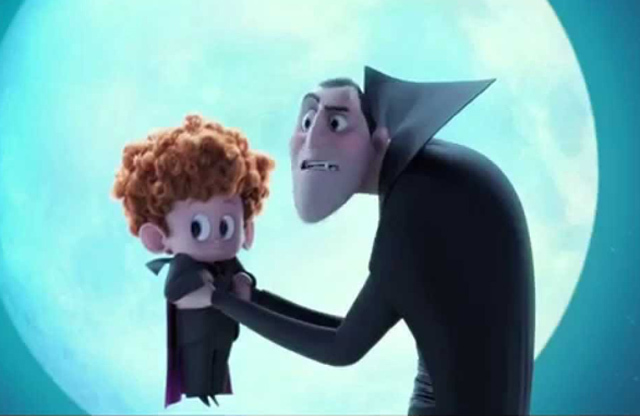 And before you know it he learns he’s going to be a “vamp-pa.” That’s a vampire grandpa, and it’s a joke that the film repeats with the same exact phrasing and explanations multiple times, in hopes that repetition alone will lead to anything resembling humor. From there the movie becomes something of a Frankenstein’s Monster itself, turning into a mashup of half a dozen recent vintage Sandler comedies like “Grown Ups” and an “Expendables” style mission that puts old dudes back into action. The plot hinges on the overly protective drac’s efforts to make sure his new grandson continues the Dracula family bloodline and becomes a vampire instead of a human. 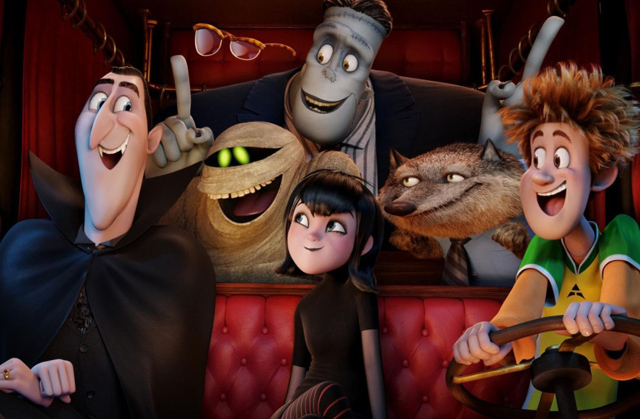 He recruits his old crew – Frankenstein, Werewolf, The Mummy, and the Invisible Man (voiced by Sandler regulars Kevin James, Steve Buscemi and David Spade, in addition to newcomer Keenan-Michael Key) – to teach the young boy how to scare people. Meanwhile the little boy’s vampire mother Mavis (Selena Gomez), and his backpack toting Southern California dad (Andy Samberg wasted in a thankless role) go back to California to see if living among humans might be a safer place to raise their little boy. The movie doesn’t really give its female characters much of a say. Dracula is forever complaining about Mavis being an overprotective mom, but his own smothering batty tactics are unremarked upon. The one exception is a female wolf pup named Winnie, who shows some spark and toughness while turning into the young half-human-half-vampire boy’s best friend. She also happened to be the character my daughter Helen liked in the movie. The original’s one genuine laugh came when Sandler’s Dracula spots a sparkly skinned “Twilight” vampire on television and grouses to the camera about vampires are represented. The closest thing to the sequel has to a cultural touchstone is a reference to Count Chocula. The sequel does have more chuckles than the original, but it’s frenetic, sometimes desperate plot has little to do with them – they’re mostly Family Guy style cutaway gags (such as the hotel’s yoga program which involves guests and a medieval rack torture device, or a werewolf tennis instructor). The film demonstrates pitch perfect casting by bringing in Mel Brooks to play Dracula’s dad Vlad, but it doesn’t allow him to do much. It instead rushes him into an abrupt formulaic climax, and a just as abrupt formulaic dance party. I can’t say I hated this one as much as I detested the original, and my three year-old twins actually sat still – for the most part – through the whole movie, and kinda liked parts of it. If keeping your kids occupied is your only objective, you could do a lot worse, but it’s doubtful this will be one they’ll beg to see over and over again. Thank heavens.